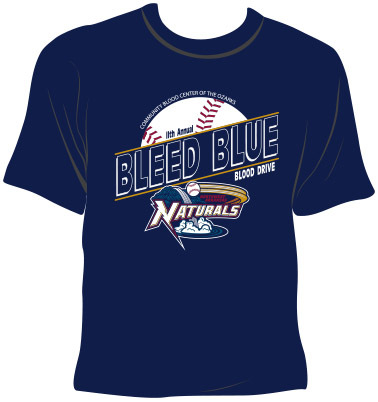 Tuesday, June 5, 2018, Community Blood Center of the Ozarks and the Northwest Arkansas Naturals will hold the 11th annual Bleed Blue Blood Drive. Each Bleed Blue Blood Drive participant will receive two reserved dugout premium tickets (seats behind either dugout) to the June 7, 2018, Naturals baseball game vs. the Springfield Cardinals, a collectible T-shirt featuring the Naturals team logo, and will be automatically registered to win other great prizes including autographed Naturals gear or even the opportunity to throw out the first pitch at the game! CBCO will offer free ballpark food at the blood drive, including hot dogs, chips, and sodas. You can schedule your 2018 Bleed Blue Blood Drive donation now. We’ll send a reminder the day before. It will only take a moment to set up your online account if you haven’t already done so. The Bleed Blue Blood Drive is one of the largest single-day blood drives of the summer. Since the drive began in 2008, thousands of lives have been affected by the blood donations that the drive generates. Thank you to our event sponsors of iHeart Radio — KIX 104, Magic 107.9, Hot Mix 101.9, 93.3 The Eagle; Raising Cane’s; and Four Points by Sheraton. If you are 17 or older (or 16 with parental consent — download our form by clicking HERE), in general good health, and have not donated blood since April 10, 2018 (56 days), you are eligible to participate in this event. If you have questions about your eligibility (for example, if you are taking specific medications), please call 1-800-280-5337 or email us through our contact form HERE.